LED Lights add COLOR to any bath, hot tub, or portable spa with an existing 12 volt light, including front access light niches. LED Spa Light with 27 Ultra Bright LEDs, 12 volt use only. This very bright LED is a cluster of 27 LED, red, blue, green, and white, with 10 different color patterns selectable by cycling the power source on-off, creating a new color with each cycling. Suitable for use with air switched or electronic spa controls. White LEDs allow colors such as pink, light blue, light purple, colors which are not available with other types of LEDs. Will work with front access light niches, allowing use in whirlpool bath tubs too. Diameter is approximately 1-3/4" (44.5mm). How long will the LEDs in a Ultra Bright light last? brightest and most brilliant colors. How does the LED light change colors? 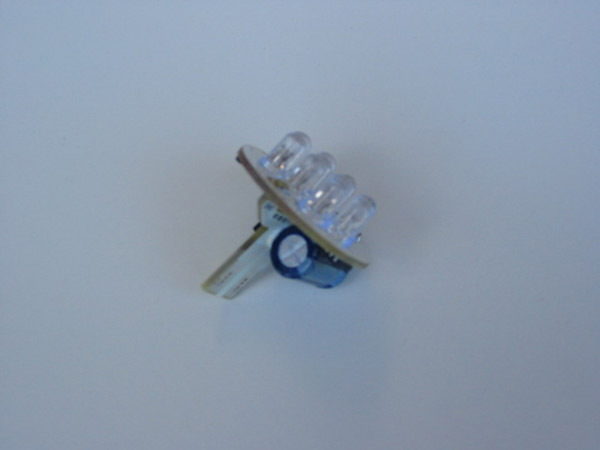 Our LED Light uses a microprocessor to mix the light created by its combination of red, green and blue LEDs. This color mixing creates multiple lighting modes for you to enjoy in your spa. Can I install an Ultra Bright LED light myself? Replacing your existing spa light with the LED light is as easy as changing a light bulb! See the ColorGlo Installation User Guide for details on the simple, 5-step installation process. In which manufacturers' spas can the LED lights be used? in spas with dimming systems.